DCI detectives on Monday arrested a Kenya Defence Forces (KDF) soldier and a Kenya Methodist University (KeMU) student in connection to a kidnapping incident in Nairobi’s Eastleigh area. Private Mohamed Sharmake Abdi of Kahawa Barracks (No.95592) and Abdi Hamid Mohamed Abdi were apprehended alongside Abdikalif Mohammed Noor, Ahmed Abdullahi Abdi (driver of the vehicle) and a Salah Abdi. They are said to have abducted three people in a private car and demanded for Sh5,000 ransom for each of the victims. The three victims have since been rescued. “The soldier, No. 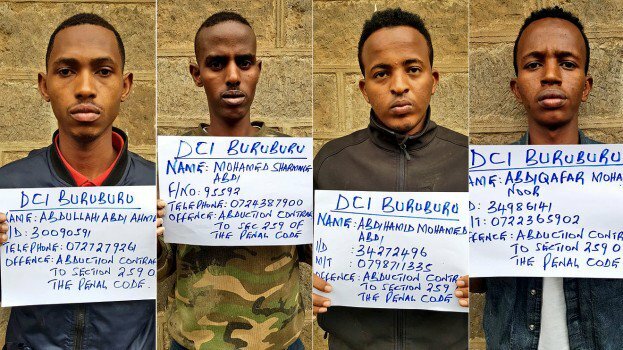 95592, Private Mohamed Sharmake Abdi of Kahawa Barracks, Abdi Hamid Mohamed Abdi a Student at the Kenya Methodist University, Mr Abdikalif Mohammed Noor, Ahmed Abdullahi Abdi and Salah Abdi will be arraigned in court today,” the DCI said in the statement. On Monday, an NIS officer based in Wajir Abdi Alio was arrested with two others in the same area. They were in possession of two pistols, six sachets of heroin, and 40g of bhang.